These two CDs present some of Martinu’s most attractive chamber music, and include all the instrumental pieces to which he appended the word ‘madrigal’ in the title, from the five delightful Madrigal Stanzas which he wrote for Albert Einstein to play, to the dazzling Three Madrigals for violin and viola. In some quarters to be eclectic in art is still tantamount to asking not to be taken seriously, as if to draw one’s inspiration from whatever source seems most fruitful were an abnegation of one’s personality. Yet, as the music on these discs clearly demonstrates, to be eclectic—which Martinu was—is not at all the same thing as being a dilettante—which he most certainly was not. No one who knows anything about Martinu’s large output would dream of accusing him of being superficial, even though his music is frequently light-hearted. It is always serious though never earnest; invariably well crafted but never academic; and usually easy on the ear yet seldom on the intellect. Few composers have expressed their personality as clearly in their music as Martinu, and listening to his work is to find oneself in the presence of a fertile intelligence and the company of an introspective but extremely likeable man. Bohuslav Martinu left his native Czechoslovakia in 1923 to take up residence in Paris, then the artistic capital of Europe. Though shy, he listened intently and read widely, and it was inevitable, being the man he was, that sooner or later he would get to grips with jazz. As it happened it was sooner than most of his contemporaries, for he had first flirted with the genre in 1922 in the ballet Who is the most powerful in the world?, and he retained an interest in it up to the end of the decade, using it in such specific orchestral pieces as Le Jazz and Jazz Suite, in piano and chamber music, and in stage works, especially the ballet Échec au Roi and the operas Les Larmes du couteau and Les Trois Souhaits. For the most part Martinu used jazz and popular dance rhythms for colouristic purposes, eschewing any temptation to make something esoteric out of them. This may be why his ‘jazz’ music sounds fresher and more convincing than that of, for instance, Hindemith, Krenek or Stravinsky. Martinu’s interest in the madrigal spanned almost the whole of his working life. It began specifically on 5 January 1922 when he heard in Prague a recital by The English Singers which included music by Byrd, Weelkes, Gibbons and others. The English Singers were a famous British group founded during the First World War. At the time Martinu heard them Steuart Wilson was a leading member; at a much later date they were to number Peter Pears in their ranks. Fired by the English form, Martinu seems to have remained unaware of the Italian madrigalists for several more years. This may explain why this type of composition found no direct expression in his own work until 1937. Even then it did so not as vocal but as instrumental music. Indeed, though there are vocal examples in his output, it may be inferred that the composer was not greatly interested in the literary aspects of the madrigal. Of his three sets for voices the first, the Eight Madrigals of 1939, is not of madrigals in the strict sense at all, and though the Five Czech Madrigals of 1948 display some of the characteristics of the classical model, only those in the Part-Song Book of 1959, one of Martinu’s last compositions, come measurably close to it. All four instrumental works to which Martinu attached the name ‘madrigal’ are included here. They bear little formal resemblance to the vocal models of either the English variety or the Italian. It was the contrapuntal nature and clarity of line of the classic madrigal that attracted him, and it is as likely to have been the experimental work of composers like Gesualdo, Marenzio and Monteverdi as the madrigals of Wilbye and Morley that provided the true stimulus to his own madrigal compositions when the time came. During 1937 Martinu was largely occupied in completing Julietta, the opera conceived around Georges Neveux’s dream play, and with writing the folk cantata Kytice (‘Bouquet of Flowers’). The former had a profound effect on the composer’s subsequent development and on his preference for fantasia-like forms. The latter, based as it is on folk poems and on music strongly inflected with Czech accents, heralded Martinu’s conscious return to his national roots. The effects of both are to be heard to a greater or lesser degree in all the music on this first disc. In addition to two concerted works featuring the violin, the other principal compositions of that year were for various instrumental combinations including a fourth string quartet and the set of Four Madrigals for oboe, clarinet and bassoon composed in Nice during the summer for the Trio d’Anches. This was the first time Martinu used the title. The introspective mood of Julietta is evident in the restrained character of each of the four pieces, and particularly discernible in the slow second. The Czech inflections are less pronounced but are detectable in the shape of the melodies. As has been suggested, it was the linear independence of the madrigal that appealed most to Martinu, and in these four pieces it is exploited to the full. There are passages of imitation, but for the most part the three instruments pursue their own ways towards a conclusion, striking against each other and producing angularities of harmony that recall Stravinsky or, more consistently, the calculated spikiness of Honegger, a composer for whom Martinu entertained the greatest admiration. In spite of the ‘modernities’, however, the music is graceful, cool, and elegantly fashioned throughout. Among Martinu’s acquaintances in America was the famous physicist Albert Einstein. Einstein was a modest violinist but apparently good enough to play Mozart sonatas with his friend the pianist Robert Casadesus. The Five Madrigal Stanzas were composed for this remarkable duo exactly one year after the Madrigal Sonata and are dedicated to Einstein, who is said to have played them with Casadesus at Princeton in private recitals. They are more strongly inflected with elements of Czech folk song than the two previous madrigal compositions and, in deference to the amateur status of the dedicatee, are all of slow or, at most, moderate speeds. The violin part is comparatively simple but deceptively so, and there is obvious ‘writing down’ to the recipient. The piano part, on the other hand, is considerably more difficult as befitted Casadesus’s great reputation as a keyboard virtuoso. Though Martinu had made every effort to tailor his demands to Einstein’s technical limitations, Einstein was unable to make a reciprocal gesture to the composer’s scientific amateurism and Martinu’s rueful attempts to get to grips with the Theory of Relativity consequently remained unfulfilled. In 1946, while at Tanglewood, Martinu suffered concussion following a fall. For several years after this he found composition very difficult and much of the music he produced at that time lacked the spontaneity and inventiveness of his best work. However, his interest in the music of Haydn was reawakened and he wrote a number of works under Haydn’s influence, notably a Sinfonia Concertante. But it is Mozart who seems to have provided the stimulus for the last of the instrumental madrigal compositions, the Three Madrigals for violin and viola which he wrote for, and dedicated to, Lillian and Joseph Fuchs who played them in New York in 1948. Although they do not subscribe to any conventional classical form, these three pieces, two fast ones enclosing a slow pastoral-like Andante, recall the sonata structure of Mozart’s celebrated duos for this same combination. It would be fair to say, however, that Martinu’s handling of the medium appears to be less fluent than the Viennese master’s, since he relies more on the cutting edge of the clashing voices for his effects than Mozart, who invoked the voluptuousness of the viola to provide a resonant cushion of implied harmony alien to Martinu’s linear intentions. In 1927 Martinu wrote no fewer than three ballets, an opera, several piano pieces and some chamber music. The last of the three ballets was La Revue de Cuisine (‘The Kitchen Review’). This was written for a Czech dance company who produced it with great success in Prague in November that year under the title Pokušení svatouška hrnce (‘The Temptation of the Saintly Pot’). The plot concerns the activities of various kitchen utensils. The marriage between pot and lid is threatened by the machinations of the stick who attempts to lure the lid with the dishcloth. The broom tries to restrain the cloth, but the lid rolls away. All is finally and happily resolved when a huge foot kicks the lid back on stage to be reunited with the long-suffering pot. In 1930 the four pieces which make up the score were performed independently at the Concerts Cortot and were published as a concert suite the same year. The four pieces are ‘Prologue’, ‘Tango’, ‘Charleston’ and ‘Finale’, and the ‘orchestra’ consists of a sextet of clarinet, bassoon, trumpet, violin, cello and piano, a combination well suited to producing a sound similar to that of the typical Paris jazz bands of the period. The ‘Prologue’ begins with a fanfare followed by a march in a perkily distorted rhythm. This is taken up and developed by the various instruments. In the ‘Tango’ first the cello, then muted trumpet, pizzicato strings and the bassoon in the upper register underline with lugubrious irony the ‘Spanish’ inflexions of a dance which was as much a craze in the ’20s as the Charleston. As if to emphasize the point the ‘Tango’ dissolves into the ‘Charleston’, the band picking up the new rhythm in a delicious re-creaction of collective improvisation. Milhaud, Copland and Gershwin have received more praise for their jazz works, but it could be argued convincingly that Martinu heard what jazz bands were doing more clearly and translated their style more accurately than any of them. The ‘Finale’ begins with a return to the initial fanfare, but goes on to realize the mood of rejoicing in echoes of James P Johnson’s classic Charleston and barely disguised references to other popular American dance tunes of the time. 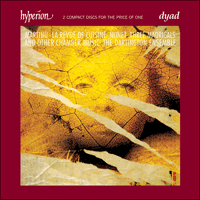 Martinu considered the score of La Revue de Cuisine technically perfect, as well he might, for it fulfills its function with the utmost economy of means. He might have said the same of the Nonet which he completed on 1 March 1959, five months before his death. He had travelled far, both artistically and geographically, in the thirty-two years that separate this Nonet from La Revue de Cuisine, and he was already dying of cancer when he wrote it. Yet the music, like so many of his other works composed at such speed in these last few months of life, betrays no sign of haste or of the darkening shadows of death. Written for string quartet with double bass, flute, clarinet, oboe, horn and bassoon, it is dedicated to the Czech Nonet who gave the first performance at the Salzburg Festival on 27 July 1959. It artfully embodies in its three movements the two themes which occupy so much of the chamber music of Martinuº’s last years, namely nostalgia for his Czech homeland (which he had not seen since before the War) and the Classical style of Haydn (with whose work he had become enamoured during his last years of exile in America). Never much drawn to Classical forms or unduly respectful of the great masters, Martinu nevertheless contrived to make this Nonet into a testament of these two ideals. All three movements are redolent of the kind of music played by country musicians in Bohemia and Moravia, but the first especially, with its crisp Haydnesque themes, clarity of texture and clever use of counterpoint, reveals the composer’s selective and highly individual response to the past. It holds together perfectly, serenely confident, sunny even, in its affirmation of life. In 1941 Martinu and his wife were forced to flee Paris before the advancing German armies. By way of Aix-en-Provence, Barcelona, Madrid and Lisbon they made their way to New York and for the next seven years remained exiled in America. For much of the time Martinu felt profoundly isolated from his European background but, unlike Bartók, Martinu had a basically optimistic nature which helped to see him through even the worst depressions. There were periods of considerable happiness, however, especially the holidays spent in New England. In the summer of 1944, after a particularly severe bout of melancholy which produced the third Symphony, the Martinus went to stay at Ridgefield, Connecticut. After a short break doing absolutely nothing—very rare for Martinu—he completed the Trio for flute, cello and piano in the five days between 26 and 31 July. Purged of all his depressions, the Trio, which was commissioned by René le Roy, emerged as a refreshingly effervescent reaffirmation of his Czech roots. After the first performance in February 1945, Virgil Thomson described it as a ‘gem of bright sound and cheerful sentiment’. Like most of Martinu’s music this Trio is tonal even when the tonality remains fluid. Actually there are only three works—all trios—to which Martinu ascribed key signatures, and this Trio in F is one of them. Its first movement is a buoyant dance-like structure in modified sonata form; the slow movement, a lyrical Adagio in 6/4 time, is in C minor, while the last, which is introduced by a slowish cadenza for the flute, is another dance-orientated movement. The Sonatina for two violins and piano was completed by the end of 1930. A comparatively short piece, under fifteen minutes’ duration and in four movements, the Sonatina brings together various strands within the one idiom: a plain neo-Classical formal outline, the occasional ‘blue’ false relation of jazz, and the inflexion of Moravian folk themes. However, even in such a straightforward outline of the work’s features, we may be surprised to encounter a less-than-predictable harmonic structure: the first movement is in G, the last in D.
The first movement is in the simplest ABA form, with a tiny coda tacked on. The violins keep at their quaver pulses virtually throughout, the music the most neo-Classical in spirit of the four. The second movement, in C minor, explores the instrumentation more questioningly with two-part writing for each violin (producing a four-part texture) answered by a gentle folk-idea in distant piano octaves—this constitutes the first part of another plain ABA design; soft-spanned G major chords against rising violin answers form the central section, with a reminiscent recapitulation of the opening part bringing the movement to a close in C major, the piano’s octave Bs as the leading note, but falling in fact to B flat for the vivacious Allegretto and Trio in 3/4 with each beat itself made up of triplets, producing a whirling 9/8 effect. The Trio is incredibly delicate and fragile before the Allegretto returns as before. The finale, likewise, barely pauses for breath on its heady journey. The character of the music is more sturdy, more ‘Bach-like’ perhaps, and in this movement one can sense Martinu’s growing sense of delight in his fascinating medium, so much so that one can hardly envisage the music being conceived for any other ensemble. A marvellous piece—the final D leaving us wanting more, surprised that it is already the end. By the spring of 1932 Martinu had returned to the medium, producing an important Sonata for two violins and piano; and in 1937 and 1950 he wrote two Concertos for two violins and orchestra. Il est des milieux où être éclectique en art revient presque à demander de ne pas être pris au sérieux, comme si puiser son inspiration à la source qui semble la plus fructueuse était une abnégation de la personnalité. Pourtant, et la musique des présents disques en est une démonstration flagrante, être éclectique—ce que Martinu était—ne signifie en rien être dilettante—ce que Martinu n’était très certainement pas. Quiconque connaît sa volumineuse production ne songerait à l’accuser de superficialité, malgré une musique souvent légère; toujours sérieuse mais jamais grave, invariablement bien ouvragée mais jamais académique, elle est généralement agréable à écouter, bien que rarement intellectuelle. Peu de compositeurs ont exprimé leur personnalité dans leur musique aussi clairement que Martinu, dont l’œuvre nous met en présence d’une intelligence fertile, d’un homme introspectif mais fort agréable. En 1923, Bohuslav Martinu quitta sa Tchécoslovaquie natale pour s’installer à Paris, alors capitale artistique de l’Europe. Quoique timide, il écouta attentivement et lut beaucoup; et il était inévitable qu’un tel homme fût, tôt ou tard, confronté au jazz. Il le fut, en l’occurrence, plus tôt que la plupart de ses contemporains, lui qui avait déjà frayé une première fois avec ce genre en 1922, dans le ballet Qui est le plus puissant au monde?, et avait continué de s’y intéresser jusqu’à la fin des années 1920, l’utilisant dans des pièces orchestrales spécifiques comme Le Jazz et Suite de jazz, mais aussi dans de la musique pour piano et de la musique de chambre, ainsi que dans des œuvres scéniques, notamment le ballet Échec au Roi et les opéras Les Larmes du couteau et Les Trois Souhaits. Pour l’essentiel, il recourut à des rythmes de jazz et de danses populaires à des fins coloristes, fuyant toute tentation d’en faire quelque chose d’ésotérique. Ce qui explique peut-être pourquoi sa musique de «jazz» paraît plus fraîche et convaincante que celle de Hindemith, de Krenek ou de Stravinski, par exemple. L’intérêt de Martinu pour le madrigal, qui marqua presque toute sa vie, naquit le 5 janvier 1922, à Prague, lors d’un récital de The English Singers réunissant des pièces de Byrd, Weelkes, Gibbons, etc. Célèbre groupe britannique fondé durant la Première Guerre mondiale, The English Singers comptait, à l’époque où Martinu l’entendit, Steuart Wilson parmi ses membres principaux, avant d’être rejoint, beaucoup plus tard, par Peter Pears. Enflammé par la forme anglaise, Martinu ignora apparemment encore plusieurs années les madrigalistes italiens—ce qui pourrait expliquer pourquoi ce type de composition ne trouva pas d’expression directe dans son œuvre avant 1937, sous forme de musique instrumentale, d’ailleurs, et non vocale. Et, bien que sa production comporte quelques exemples vocaux, nous pouvons en inférer qu’il ne s’intéressait guère aux aspects littéraires du madrigal. Sur ses trois corpus pour voix, le premier, les Eight Madrigals (1939), présente des pièces qui ne sont en rien des madrigaux au sens strict du terme et, quoique les Five Czech Madrigals (1948) fassent montre de quelques caractéristiques du modèle classique, seuls les madrigaux du Part-Song Book (1959)—l’une de ses dernières compositions—s’en approchent sensiblement. Les quatre œuvres instrumentales auxquelles Martinu associa le nom «madrigal» sont incluses ici; elles présentent peu de ressemblance formelle avec leurs modèles vocaux, tant anglais qu’italiens. Martinu fut attiré par la nature contrapuntique et la clarté de ligne du madrigal classique et, le moment venu, le véritable stimulus de ses compositions madrigalesques vint probablement autant des pièces expérimentales de compositeurs comme Gesualdo, Marenzio et Monteverdi que des madrigaux de Wilbye et de Morley. L’année 1937 vit Martinu en grande partie occupé à achever Julietta, l’opéra conçu autour de l’œuvre onirique de George Neveux, et à écrire la cantate populaire Kytice («Bouquet de fleurs»). Julietta influença profondément le développement ultérieur du compositeur et sa préférence pour des formes de type fantaisie, cependant que Kytice—fondée sur des poèmes populaires et sur une musique fortement infléchie par des accents tchèques—annonça son retour conscient vers ses racines nationales. Ces deux traits ponctueront, dans une plus ou moins large mesure, toute la musique de ce premier disque. Outre deux œuvres de concert mettant en scène le violon, les principales autres pièces de 1937, destinées à diverses combinaisons instrumentales, comprirent un quatrième quatuor à cordes et le corpus des Four Madrigals pour hautbois, clarinette et basson, composé à Nice, durant l’été, pour le Trio d’Anches—Martinu utilisa alors le mot «madrigal» pour la première fois. L’humeur introspective de Julietta, manifeste dans le caractère retenu de chacune des quatre pièces, est particulièrement discernable dans la deuxième, lente. Quant aux inflexions tchèques, moins prononcées, elles demeurent décelables dans la forme des mélodies. Comme nous l’avons déjà suggéré, Martinu fut surtout attiré par l’indépendance linéaire du madrigal, exploitée au maximum dans ces quatre pièces. Hors quelques passages d’imitation, les trois instruments suivent le plus souvent leur propre chemin vers une conclusion, se cognant les uns aux autres et engendrant des angularités harmoniques qui rappellent Stravinski ou, plus constamment, l’acerbité calculée de Honegger, compositeur pour lequel Martinu entretenait la plus vive admiration. Nonobstant les «modernismes», cette musique est gracieuse, fraîche et élégamment ouvragée. Parmi les connaissances de Martinu en Amérique figurait le célèbre physicien Albert Einstein, violoniste modeste mais apparemment assez bon pour jouer des sonates de Mozart avec son ami, le pianiste Robert Casadesus. Les Five Madrigal Stanzas, composées pour ce remarquable duo juste un an après la Madrigal Sonata, sont dédiées à Einstein, qui les aurait jouées avec Casadesus, à Princeton, lors de récitals privés. Plus fortement infléchies par des éléments de chants populaires tchèques que les deux compositions madrigalesques précédentes, elles sont, par déférence envers le statut d’amateur du dédicataire, d’allure lente ou, au plus, modérée. La partie de violon est relativement, mais trompeusement, simple, avec une «considération» manifeste pour le récipiendaire. A contrario, la partie de piano, considérablement plus difficile, sied à la grande réputation de pianiste virtuose de Casadesus. Martinu fit tout son possible pour adapter ses exigences aux limites techniques d’Einstein, mais ce dernier ne put rendre la pareille à l’amateurisme scientifique du compositeur, dont les tentatives chagrines de compréhension de la théorie de la relativité demeurèrent frustrées. En 1946, Martinu, alors à Tanglewood, fut atteint d’une commotion cérébrale consécutive à une chute. Pendant plusieurs années, la composition lui parut très difficile et beaucoup de pièces produites à cette époque n’eurent pas la spontanéité et l’inventivité de ses meilleures œuvres. Cependant, son intérêt pour la musique de Haydn se ranima et il écrivit un certain nombre de pièces d’influence haydnienne, notamment une Sinfonia Concertante. Mais c’est Mozart qui semble avoir stimulé ses dernières compositions madrigalesques instrumentales, les Trois Madrigaux pour violon et alto, écrits pour Lillian et Joseph Fuchs (également dédicataires de l’œuvre), qui les jouèrent à New York, en 1948. Bien que ne souscrivant à aucune forme classique conventionnelle, ces trois pièces—deux rapides encadrant un lent Andante de type pastorale—rappellent la structure de sonate des célèbres duos mozartiens pour la même combinaison instrumentale. Force est cependant de reconnaître que le traitement de cette combinaison semble moins fluide chez Martinu que chez le maître viennois, Martinu se fondant davantage sur le bord tranchant des voix qui s’entrechoquent, tandis que Mozart invoque la sensualité de l’alto pour obtenir un coussin résonnant d’harmonie implicite, étrangère aux intentions linéaires de Martinu. En 1927, Martinu composa pas moins de trois ballets, un opéra, plusieurs pièces pour piano et de la musique de chambre. Le dernier des trois ballets, La Revue de Cuisine, fut écrit pour une compagnie de danse tchèque, qui le donna avec succès à Prague, en novembre de la même année, sous le titre Pokušení svatouška hrnce («La tentation de la sainte marmite»). L’intrigue tourne autour des activités de divers ustensiles de cuisine: le mariage de la marmite et du couvercle est menacé par les machinations du balai, qui tente de séduire le couvercle avec le torchon à vaisselle. Le balai tente de retenir le torchon, mais le couvercle s’éloigne. Tout est finalement, et heureusement, résolu par un énorme pied qui renvoie le couvercle sur l’étagère, afin qu’il retrouve la patiente marmite. En 1930, les quatre pièces de cette partition—intitulées «Prologue», «Tango», «Charleston» et «Finale»—furent interprétées indépendamment, aux Concerts Cortot, et publiées sous forme d’une suite de concert; quant à l’«orchestre», il consiste en un sextuor (clarinette, basson, trompette, violon, violoncelle et piano) parvenant bien à rendre la sonorité des orchestres de jazz parisiens typiques de cette époque. Le «Prologue» s’ouvre sur une fanfare, suivie d’une marche sise dans un rythme gaiement distordu, reprise et développée par les différents instruments. Dans le «Tango», le violoncelle, puis la trompette étouffée, les cordes pizzicato et le basson, dans le registre supérieur, soulignent avec une ironie lugubre les inflexions «espagnoles» d’une danse qui connut, dans les années 1920, un engouement comparable à celui du charleston. Comme pour accentuer cette référence, le «Tango» se dissout dans le «Charleston», l’orchestre reprenant le nouveau rythme dans une délicieuse re-création d’improvisation collective. Milhaud, Copland et Gershwin ont été plus loués que Martinu pour leurs œuvres de jazz, mais l’on pourrait plaider de manière convaincante que Martinu entendit plus clairement le travail des orchestres de jazz, traduisant leur style avec davantage de précision qu’aucun de ces trois compositeurs. Le «Finale» débute par un retour à la fanfare initiale avant de passer à une atmosphère de réjouissance avec des échos du classique Charleston de James P. Johnson et des références, à peine déguisées, à d’autres mélodies de danses populaires américaines de l’époque. Martinu tenait la partition de La Revue de Cuisine pour techniquement parfaite, ce qui n’a rien de surprenant, tant elle remplit sa fonction avec la plus extrême économie de moyens. Il aurait pu en dire autant du Nonet achevé le 1er mars 1959, cinq mois avant sa mort. Il avait voyagé loin, artistiquement comme géographiquement, durant les trente-deux années qui séparent ce Nonet de La Revue de Cuisine, et il se mourait déjà d’un cancer au moment de sa composition. Cette pièce—et moult autres œuvres composées si rapidement dans les derniers mois de sa vie—ne porte pourtant aucun signe de hâte ou d’ombres menaçantes de la mort. Écrite pour quatuor à cordes avec contrebasse, flûte, clarinette, hautbois, cor et basson, cette œuvre est dédiée au nonet tchèque qui la joua pour la première fois le 27 juillet 1959, au festival de Salzbourg. Ses trois mouvements englobent habilement les deux thèmes qui occupent une place si importante dans la musique de chambre des dernières années de Martinu, savoir la nostalgie de sa patrie tchèque (qu’il n’avait pas revue depuis l’avant-guerre) et le style classique de Haydn (des œuvres duquel il s’était épris lors de ses dernières années d’exil en Amérique). Jamais très attiré par les formes classiques, jamais trop respectueux des grands maîtres, Martinu s’efforça toutefois de faire de son Nonet un testament de ces deux idéaux. Ses trois mouvements rappellent la musique des musiciens de campagne bohémiens et moraves—le premier mouvement, notamment, avec ses thèmes haydnesques vifs, sa clarté de texture et son usage intelligent du contrepoint révèle la réponse sélective et fort individuelle du compositeur au passé. Il se maintient parfaitement, sereinement confiant, voire rayonnant, dans son affirmation de la vie. En 1941, Martinu et sa femme, contraints de fuir Paris devant l’avancée des troupes allemandes, gagnèrent New York via Aix-en-Provence, Barcelone, Madrid et Lisbonne, et demeurèrent sept ans en Amérique. Pendant une grande partie de cet exil, Martinu se sentit profondément isolé, loin de ses racines européennes, mais, contrairement à Bartók, sa nature fondamentalement optimiste l’aida à surmonter même les pires dépressions. Il vécut, cependant, des moments de grand bonheur, surtout les vacances passées en Nouvelle-Angleterre. Au cours de l’été 1944, après un accès de mélancolie particulièrement grave (qui se traduisit par la Troisième symphonie), les Martinu se rendirent à Ridgefield, dans le Connecticut. Passé une courte période de totale inactivité—chose très rare chez lui—, Martinu acheva le Trio pour flûte, violoncelle et piano, du 26 au 31 juillet. Commandé par René le Roy, ce Trio apparut comme une réaffirmation, agréablement effervescente, des racines tchèques d’un compositeur alors libéré de toutes ses dépressions. Après la première interprétation en février 1945, Virgil Thomson le décrivit comme «une gemme à la sonorité éclatante, au sentiment gai». À l’instar de la plupart des pièces de Martinu, ce trio est tonal, même lorsque la tonalité demeure fluide. En réalité, Martinu n’attribua des armatures qu’à trois œuvres—toutes des trios—, dont celle-ci, en fa. Le premier mouvement est une allègre structure dansante, sise dans une forme sonate modifiée; le mouvement lent, un Adagio lyrique à 6/4, est en ut mineur, tandis que le dernier mouvement, introduit par une cadence assez lente pour la flûte, est un nouveau mouvement orienté vers la danse. La Sonatina pour deux violons et piano, achevée vers la fin de 1930, est une pièce relativement courte (moins de quinze minutes), qui compte quatre mouvements et rassemble divers courants à l’intérieur de l’idiome unique: une structure formelle totalement néoclassique, l’occasionnelle fausse relation «blue» du jazz, et l’inflexion de thèmes populaires moraves. Cependant, nous pourrions être surpris de rencontrer, dans un cadre de caractéristiques aussi net, une structure tout sauf prévisible: le premier mouvement est en sol, le dernier en ré. Le premier mouvement est dans la forme ABA la plus simple, avec une minuscule coda affixée. Les violons maintiennent presque toujours leurs rythmes de croches, cette musique étant la plus néoclassique des quatre mouvements. Le deuxième mouvement, en ut mineur, explore l’instrumentation de manière plus interrogative, avec une écriture à deux parties pour chaque violon (produisant une texture à quatre parties), à laquelle répond une douce idée populaire dans de lointaines octaves pianistiques—ce qui constitue la première partie d’une autre structure complète ABA; des accords de sol majeur doucement déployés contre des réponses violonistiques ascendantes forment la section centrale, une reprise nostalgique de la partie initiale conduisant le mouvement à une fin en ut mineur, avec les octaves pianistiques de si pour sensible, mais descendant en fait au si bémol pour le vivace Allegretto et Trio à 3/4, chaque battement étant lui-même formé de triolets, d’où un effet tournoyant à 9/8. Le Trio est incroyablement délicat et fragile, avant que l’Allegretto ne revienne comme auparavant. À l’identique, le finale marque à peine une pause dans son voyage enivrant. Le caractère de la musique est plus vigoureux, plus «bachien» peut-être, et ce mouvement nous permet de ressentir le ravissement grandissant de Martinu face à son fascinant moyen d’expression, à tel point que nous ne saurions guère envisager cette musique pour un autre ensemble. Nous tenons là une pièce merveilleuse—le ré final nous laissant dans l’attente, surpris que ce soit déjà la fin. Au printemps 1932, Martinu revint au trio, avec une importante Sonate pour deux violons et piano; il fit de même en 1937 et 1950, avec deux Concertos pour deux violons et orchestre. Manche Leute betrachten den Eklektiker im Bereich der Kunst immer noch als jemanden, der wohl nicht ganz ernst genommen werden will; als ob etwa die Tatsache, daß einer seine Inspiration aus unterschiedlichen Quellen nach dem Gesichtspunkt zusammenträgt, was ihm am fruchtbarsten erscheint, einer Selbstverleugnung gleichkäme. Denn wie die Musik auf diesen CDs ganz eindeutig zeigt, bedeutet eklektisch zu sein—was Martinu nun einmal war—gewiß nicht dasselbe wie ein Dilettant zu sein – der er keineswegs war. Niemand, der den Umfang des Gesamtwerkes Martinus kennt, würde es sich anmaßen, ihn als oberflächlich zu bezeichnen, obgleich seine Musik auch häufig etwas Leichtherziges hat. Sie ist stets ernsthaft, aber nie todernst; stets wundervoll geformt, doch nie zu kompliziert; und für gewöhnlich ist sie angenehm fürs Ohr, aber auch geistig anspruchs­voll. Es gibt nicht viele Komponisten, die ihre Persönlichkeit in ihrer Musik so klar herausarbeiteten wie Martinu; hört man seine Musik, so fühlt man sich versetzt in die Gegenwart eines kreativen Genies und in Begleitung eines introvertierten, aber äußerst liebenswürdigen Mannes. Bohuslav Martinu verließ 1923 seine Heimat Tschechoslowakei und ließ sich in Paris nieder, dem damaligen Zentrum der Kunst in Europa. Er war zwar schüchtern, aber dafür ein guter Zuhörer und sehr belesen; und für einen Mann wie ihn war es wohl unvermeidbar, daß er früher oder später beim Jazz landen würde. Schließlich war er seinen Zeitgenossen weit voraus, denn er liebäugelte bereits 1922 im Ballett Wer ist der Stärkste in der Welt? mit diesem Genre. Sein Interesse blieb bis zum Ende jenes Jahrzehnts erhalten, was sich in bestimmten Orchesterstücken wie Le Jazz und Jazz Suite, in Klavier- und Kammermusik, sowie in Bühnenwerken—dabei insbesondere beim Ballett Échec au Roi und in den Opern Les Larmes du couteau und Les Trois Souhaits—zeigte. Größtenteils verwendete Martinu zur Ausschmückung Jazz- und Tanzrhythmen, wobei er aber der Versuchung widerstand, etwas Esoterisches daraus zu machen. Dies mag auch der Grund dafür sein, warum sein „Jazz“ frischer und überzeugender klingt als zum Beispiel die Werke eines Hindemith, Krenek oder Strawinsky. Martinus Interesse am Madrigal umspannte fast seine gesamtes Künstlerkarriere. Sein Interesse daran wurde exakt am 5. Januar 1922 geweckt, als er in Prag eine Aufführung der English Singers besuchte, welche Musik von Byrd, Weelkes, Gibbons und anderen präsentierten. Die English Singers waren eine berühmte britische Gruppe, die während des Ersten Weltkrieges gegründet wurde. Zur Zeit als Martinu sie hörte, war Steuart Wilson eines der führenden Mitglieder; zu einem späteren Zeitpunkt zählte man auch Peter Pears in ihnen. Da Martinu von der englischen Form so begeistert war, scheinen die italienischen Madrigalisten einige Jahre lang wohl völlig an ihm vorübergegangen sein. Dies mag auch die Erklärung dafür sein, daß man in seinen Werken vor 1937 keinen direkten Verweis auf diese Art der Komposition findet. Und selbst von da an erscheint sie nicht als Vokal- sondern als Instrumentalmusik. In seinem Gesamtwerk gibt es zwar auch Beispiele für Vokalstücke, es läßt sich aber darauf schließen, daß Martinu nicht besonders an den literarischen Aspekten des Madrigals interessiert war. Der erste seiner drei Sätze für Gesang, die Acht Madrigale von 1939, sind strenggenommen gar keine Madrigale; und wenn auch die Fünf tschechischen Madrigale von 1948 einige Merkmale der klassischen Vorlage aufweisen, so entsprechen lediglich jene aus dem Part-Song Book von 1959, einer der letzten Kompositionen Martinus, einigermaßen dem Vorbild. Alle vier Instrumentalwerke, die Martinu als „Madrigale“ betitelte, sind hier enthalten. Diese erinnern nur vage an die Vokalmodelle englischer und italienischer Werke. Es war das kontrapunktische Wesen und die Klarheit der Linienführung der klassischen Madrigale, was ihn so faszinierte; und es ist durchaus wahrscheinlich, daß die experimentellen Werke von Komponisten wie Gesualdo, Marenzio und Monteverdi, wie auch die Madrigale von Wilbye und Morley, ihm den Anstoß gaben, zu gegebener Zeit seine eigenen Madrigal-Kompositionen zu verfassen. Während des Jahres 1937 war Martinu vornehmlich mit der Fertigstellung von Julietta beschäftigt, der Oper, die auf Georges Neveux’s Traumspiel aufbaut, sowie mit dem Schreiben der Volkskantate Kytice („Blumenbouquet“). Erstere wirkte sich wesentlich auf seine weitere Entwicklung sowie seine Vorliebe für die phantasievolle Gestaltung aus. Die zweite Kantate, die auf Volksgedichten und einer von tschechischen Akzenten geprägten Musik basiert, kündigte Martinus bewußte Rückkehr zu den Wurzeln seiner Heimat an. Die jeweiligen Auswirkungen hört man bei allen Stücken der ersten CD mal mehr, mal weniger. Neben zwei Konzertwerken für Geige, arrangierte er in jenem Jahr weitere bedeutende Kompositionen mit unterschiedlichen Instrumentierungen, darunter ein viertes Streichquartett sowie die Vier Madrigale für Oboe, Klarinette und Fagott, welche er während des Sommers in Nizza für das Trio d’Anches komponierte. Dies war das erste Mal, daß Martinu diesen Titel verwendete. Die introvertierte Stimmung von Julietta ist im verhaltenen Charakter aller vier Stücke gegenwärtig, und ist besonders deutlich im langsamen zweiten Satz zu erkennnen. Die tschechischen Einflüsse kommen hierbei nicht so stark zum Ausdruck, sie sind aber in der Melodiegestaltung erkennbar. Wie bereits erwähnt, übte die lineare Unabhängigkeit des Madrigals eine besondere Anziehung auf Martinu aus. In diesen vier Stücken wird davon reger Gebrauch gemacht. Es gibt Passagen der Nachahmung, doch größtenteils verfolgen die drei Instrumente ihren eigenen Weg in Richtung Abschluß, wobei sie gegeneinander anschlagen und ein eckiges Harmoniegefüge erzeugen, das an Strawinsky erinnert oder vielmehr an die streng kalkulierte Rechtwinkligkeit von Honegger, jenen Komponisten, den Martinu am meisten bewunderte. Und trotz all der „Modernitäten“ ist die Musik anmutig, kühl und durchgehend elegant gestaltet. Zu Martinus Bekanntschaften in Amerika zählte unter anderem auch der Physiker Albert Einstein. Einstein beherrschte die Geige nur mäßig, aber anscheinend gut genug, um mit seinem Freund, dem Pianisten Robert Casadesus, Mozart-Sonaten zu spielen. Exakt ein Jahr nach der Madrigalsonate komponierte Martinu für dieses bemerkenswerte Duo die Fünf Madrigalstanzen, die er Einstein widmete, von dem es heißt, er habe sie in Princeton zusammen mit Casadesus im Freundeskreis vorgetragen. Im Vergleich zu den beiden vorhergehenden Madrigalkompositionen sind diese viel mehr von Elementen des tschechischen Volksliedes geprägt. Und mit Bedacht auf den Amateurstatus Einsteins arrangierte er sie alle in langsamem bzw. höchstens in gemäßigtem Tempo. Der Geigenpart ist verhältnismäßig simpel, jedoch auf täuschende Art und wurde offensichtlich speziell für den Empfänger „vereinfacht“. Andererseits ist der Klavierpart wesentlich schwieriger, was dem Ruf Casadesus als Tastenvirtuose angemessen war. Obwohl Martinu jeden nur möglichen Versuch unternahm, seine Ansprüche auf Einsteins technische Grenzen abzustimmen, war es diesem unmöglich, der wissenschaftlichen Laienhaftigkeit des Komponisten entgegenzukommen. Aber auch Martinu scheiterte kläglich mit seinen Bemühungen, die Relativitätstheorie Einsteins zu verstehen. Im Jahre 1946, zu der Zeit als er in Tanglewood lebte, erlitt Martinu in Folge eines Sturzes eine schwere Gehirnerschütterung. Selbst Jahre später hatte er große Schwierigkeiten beim Komponieren, und ein Großteil der während dieser Phase geschriebenen Musik ließ die Spontaneität und den Ideenreichtum seiner früheren Arbeiten vermissen. Sein Interesse an der Musik Haydns wurde jedoch wiedergeweckt, und er schrieb eine Reihe von Werken, die ganz klar von Haydn beeinflußt waren, insbesondere die Sinfonia Concertante. Den Anreiz zur letzten seiner instrumentalen Madrigalkompositionen gab allerdings Mozart; die Drei Madrigale für Geige und Bratsche widmete er Lillian und Joseph Fuchs, die das Werk 1948 in New York präsentierten. Und wenn auch diese drei Stücke—zwei schnelle, die eine langsame hirtenartiges Andante umschließen—keiner konventionellen klassischen Gestalt entsprechen, so erinnern sie doch an die von Mozart verwendete Sonatenstruktur seiner gefeierten Duos mit der gleichen Besetzung. Es muß aber fairerweise gesagt werden, daß Martinus Umgang mit dem Medium nicht so flüssig erscheint wie der des Wiener Meisters. Dies liegt daran, daß Martinu mehr auf den krassen Zusammenprall von Stimmen setzt, wohingegen Mozart die Sinnlichkeit der Bratsche ins Feld führt, um ein klangvolles Polster der Harmonie zu schaffen, was man in der Linearität Martinus vergeblich sucht. 1927 komponierte Martinu nicht weniger als drei Ballette, eine Oper, mehrere Klavierstücke sowie einige Kammermusiken. Das letzte der drei Ballette hieß La Revue de Cuisine („Die Küchen-Revue“). Er schrieb es für eine tschechische Tanzgruppe, die es im November mit großem Erfolg in Prag unter dem Titel Pokušení svatouška hrnce („Die Versuchung des frommen Topfes“) präsentierte. Das Ballett handelt von den Aktivitäten verschiedener Küchenutensilien. Die Ehe zwischen Topf und Deckel wird durch die Machenschaften des Kochlöffels gefährdet, der mit dem Geschirrtuch versucht, den Deckel zu verführen. Der Besen versucht das Geschirrtuch zurückzuhalten, doch der Deckel rollt davon. Letztendlich gibt es ein glückliches Ende, als ein riesiger Fuß den Deckel an seinen Platz zurückschießt, und dieser sich wieder mit dem lange leidenden Topf vereinigt. Die vier Stücke, die zusammen die Partitur ergeben, wurden 1930 unabhängig voneinander bei den Concerts Cortot aufgeführt und noch im selben Jahr als Konzertsuite veröffentlicht. Diese vier Stücke sind als „Prolog“, „Tango“, „Charleston“ und „Finale“ betitelt; das „Orchester“ besteht aus einem Sextett aus Klarinette, Fagott, Trompete, Geige, Cello und Klavier—eine Besetzung, die ideal dazu geeignet ist, einen ähnlichen Sound zu produzieren, wie die typischen Pariser Jazzbands jener Zeit. Der „Prolog“ beginnt mit einer Fanfare, gefolgt von einem Marsch in einem keck verdrehten Rhythmus. Dieser wird von unterschiedlichen Instrumenten übernommen und ausgeführt. Im „Tango“ unterstreichen zuerst das Cello, dann die gedämpfte Trompete, Pizzicato-Streicher und das Fagott in der Oberstimme mit einer schwermütigen Ironie den „spanischen“ Klang eines Tanzes, der in den zwanziger Jahren so populär war wie der Charleston. Fast als ob der „Tango“ eben diesen Punkt betonen möchte, geht er in den „Charleston“ über, wobei die Gruppe den neuen Rhythmus in einer herrlichen Wiederbelebung der kollektiven Improvisation aufgreift. Milhaud, Copland und Gershwin ernteten zwar mehr Lob für ihre Jazzwerke, doch es läßt sich durchaus überzeugend argumentieren, daß Martinu die Fähigkeit besaß, besser zu erkennen, was Jazzgruppen leisteten und deren Stil präziser als alle anderen umzusetzen. Das „Finale“ beginnt mit einer Rückkehr der anfänglichen Fanfare und fährt fort mit der Gestaltung von freudigen Echos auf das klassische Stück Charleston von James P. Johnson sowie weiteren ungenierten Anspielungen auf andere beliebte amerikanische Tanzmelodien jener Zeit. Martinu sah die Partitur von La Revue de Cuisine als technisch perfekt an, was ihm auch zusteht, da sie ihre Funktion mit einem Minimum an Mitteln erfüllt. Selbiges mag er vielleicht auch vom Nonett gesagt haben, das er am 1. März 1959, fünf Monate vor seinem Tod, fertigstellte. In den 32 Jahren, die zwischen diesem Nonett und La Revue de Cuisine liegen, reiste er weit, sowohl im künstlerischen als auch im geographischen Sinne, und er hatte bereits ein tödliches Krebsleiden, als er es komponierte. Und wie schon so viele andere Werke zuvor, weist die Musik, die er in den letzten Monaten seines Lebens in so kurzer Zeit komponierte, dennoch keine Spur von Hast oder den dunklen Schatten des bevorstehenden Todes auf. Er schrieb das Nonett für ein Streichquartett mit Kontrabaß, Flöte, Klarinette, Oboe, Horn und Fagott, und widmete es dem Tschechischen Nonett, welches es bei den Salzburger Festspielen am 27. Juli 1959 uraufführte. Auf kunstvolle Weise umschließt es in seinen drei Sätzen die beiden Gedanken, die bei der Kammermusik Martinus in den Jahren vor seinem Tod so im Vordergrund standen, nämlich die nostalgischen Gefühle für seine tschechische Heimat (die er seit der Zeit vor dem Kriege nicht mehr gesehen hatte) sowie der klassische Stil Haydns (in dessen Musik er sich während seiner letzten Jahre im amerikanischen Exil verliebte). Martinu fühlte sich nie besonders zur klassischen Gestalt hingezogen oder zollte den großen Meistern übermäßig viel Respekt, und nichtsdestotrotz bewerkstelligte er es, dieses Nonett in ein Testament seiner beiden Ideale zu verwandeln. Alle drei Sätze erinnern stark an die Musik, die man auf dem Land in Böhmen und Mähren spielte, aber vor allem der erste Satz, mit seinen klaren Themen à la Haydn, seiner Klarheit der Textur und seiner intelligenten Verwendung des Kontrapunktes, enthüllt die wählerische und äußerst individuelle Antwort des Komponisten auf die Vergangenheit. In ihrer Beteuerung des Lebens strahlt sie völlig gelassene, ja sogar sonnige Zuversicht aus. 1941 mußten Martinu und seine Frau aufgrund der näherrückenden deutschen Truppen Paris verlassen. Über Aix-en-Provence, Barcelona, Madrid und Lissabon kamen sie schließlich nach New York und blieben für die folgenden sieben Jahre im Exil in Amerika. Die meiste Zeit fühlte sich Martinu grundlegend von seiner europäischen Herkunft entwurzelt, doch er hatte, anders als etwa Bartók, ein im Grunde optimistisches Gemüt, womit er selbst über die schlimmsten Depressionen hinwegkam. Es gab aber auch Zeiten merklicher Freude, vor allem während seiner in Neuengland verbrachten Ferien. Im Sommer 1944, nach einem besonders schweren Anflug der Melancholie, der die Komposition der Dritten Sinfonie mit sich brachte, gingen die Martinus nach Ridgefield, Connecticut. Nach einer kurzen Pause, in der er absolut nichts machte—sehr untypisch für Martinu—vollbrachte er zwischen dem 26. und 31. Juli innerhalb von nur fünf Tagen das Trio für Flöte, Cello und Klavier. Völlig frei von seinen Depressionen, zeigte sich das Trio, das von René le Roy in Auftrag gegeben wurde, als eine erfrischend überschäumende Beteuerung seiner tschechischen Wurzeln. Nach der Erstaufführung im Februar 1945 beschrieb es Virgil Thomson als „ein Juwel von herrlichem Klang und freudigem Gefühl“. Wie die meisten musikalischen Werke Martinus ist auch dieses Trio tonal, selbst wenn die Tonalität fließend bleibt. Es gibt tatsächlich nur drei Werke—alles Trios—denen Martinu eine Tonart-Vorzeichnung gab, und eben dieses Trio in F ist eines davon. Sein erster Satz hat eine heitere, tanzartige Struktur in modifizierter Sonatenform; der langsame Satz, ein lyrisches Adagio im 6/4-Takt, ist in c-Moll gefaßt, während der letzte, der durch eine gemächliche Kadenz für die Flöte eingeleitet wird, wiederum ein tanzorientierter Satz ist. Die Sonatine für zwei Geigen und Klavier stellte er Ende 1930 fertig. Sie ist ein vergleichsweise kurzes Stück—in vier Sätzen und weniger als fünfzehn Minuten Spielzeit—und verbindet mehrere Stränge zu einem Idiom: eine klare, neoklassizistische Grundform, gelegentlich eine „schräge“ Dissonanz zum Jazz sowie den Einfluß mährischer Volksmusikthemen. Jedoch selbst in einer so geradlinigen Auslegung der Merkmale des Werkes finden wir überraschenderweise eine alles andere als vorhersehbare Harmoniestruktur: der erste Satz ist in G, der letzte in D.
Der erste Satz verfügt über die einfachste A–B–A-Struktur, wobei eine winzige Koda angehängt ist. Die Geigen behalten praktisch die ganze Zeit hindurch ihren Achtelnotenrhythmus bei; es handelt sich hiermit um das Stück unter diesen vieren, bei dem der Geist des Neoklassizismus am deutlichsten zu spüren ist. Beim zweiten Satz, in c-Moll, wird die Instrumentierung etwas fragender ergründet. Beide Geigen werden zweistimmig eingesetzt (wodurch eine vierstimmige Textur entsteht) und von einem sanften Volksmusikthema in Form von entfernten Klavieroktaven erwidert—dies macht den ersten Teil einer weiteren klaren A–B–A-Struktur aus. Sanft gespannte G-Dur-Akkorde neben der Antwort aufkommender Geigen im Mittelteil, wobei eine an den Anfang erinnernde Reprise den Satz in C-Dur beendet. Das H der Klavieroktave als Leitton, das aber in Wirklichkeit im lebhaften Allegretto und Trio im 3/4-Takt zu B absinkt, wobei jede Zählzeit selbst aus Triolen besteht, und somit ein wirbelnder 9/8-Effekt erzielt wird. Das Trio ist unglaublich zart und zerbrechlich, bis schließlich das Allegretto wie zuvor wiederkehrt. Ebenso kommt das Finale während seiner rauschenden Reise kaum zu einer Verschnaufpause. Das Wesen der Musik ist robuster, vielleicht mehr in der Tradition Bachs; in diesem Satz spürt man Martinus wachsendes Gefühl der Freude an diesem faszinierenden Medium so sehr, daß man es sich kaum vorstellen kann, daß diese Musik für ein anderes Ensemble geschrieben wurde. Ein hervorragendes Stück—beim Schluß in D sehnen wir uns nach mehr und sind erstaunt, daß dies schon das Ende sein soll. Im Frühjahr 1932 kehrte Martinu zu diesem Medium zurück und schuf eine bedeutende Sonate für zwei Geigen und Klavier. In den Jahren 1937 und 1950 folgten zwei weitere Konzerte für zwei Geigen und Orchester.